When the weather warms up, McPherson Beach comes alive with volleyball action. 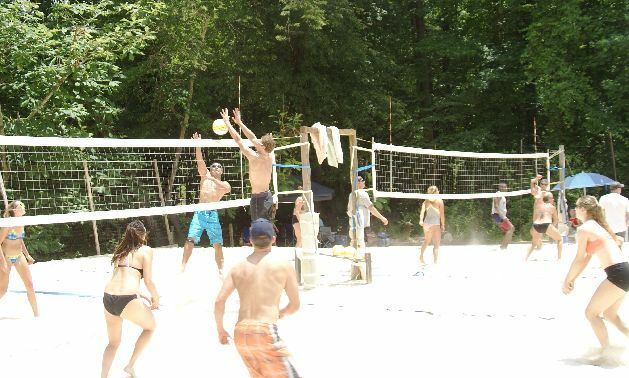 Started in 2000, the McPherson Beach Volleyball League runs from early April to late October. The 'league' consists of open play on Sat or Sun starting at 1:00 and lasting about 4 to 5 hours. Play is typically in the BB range, B level players and higher are welcomed to join the fun. After play is over, and a dip in the pool on hot days, players head to a local spot for food and drink. Click 'contact us' to request to be put on the MBVL mailing list to receive the latest league information as it becomes available. Mac Beach has two courts that are 27'X27' with professional quality nets and lines. Wilson AVP "Official Game Ball" volleyballs are used. We play 3's or 4's depending on the number of players (3's preferred). Teams play 2 games together regardless of winning or losing then rotate out. Games are rally scoring to 15, win by one if players are waiting to play, win by 2 if no one is waiting. The Mac Beach Open started in 2008 and is a series of charity tournaments benefiting Camp Twin Lakes (camptwinlakes.org). The first weekend of tournaments is typically held on the last weekend of June. Co-ed 4's on Saturday and King & Queen of the Beach on Sunday. The second weekend is typically held on the first weekend of August. Remix 4's on Saturday and 2's Mixer on Sunday. Click here for all information on the Mac Beach Open. The Player of the Year award is given to the player that wins the most games during the season. The POTY race adds a little competition to our fun and encourages players to come out as often as they can. Follow the link below for the full, current standings.